The Global Competitiveness Index and other ways to measure progress – One Billion Hungry: Can We Feed the World? The Global Competitiveness Index (GCI), developed by the World Economic Forum, measures and ranks economies in terms of their competitiveness, defined as “the set of institutions, policies and factors that determine the level of productivity of a country”. The details of this ranking and descriptions of the competitiveness landscape of individual economies are detailed in The Global Competitiveness Report, an annual publication designed to provide a “platform for dialogue between government, business and civil society about the actions required to improve economic prosperity”. This year the report covers 144 countries, which together represent 98.3% of world GDP. 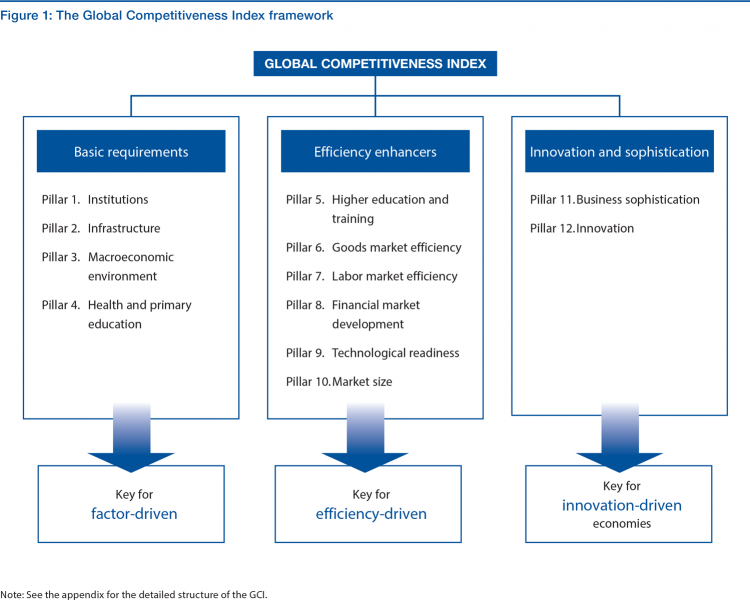 The GCI, in calculating competitiveness, combines 114 indicators under 12 pillars (shown in Figure 1 below). For more details on the methodology for compiling the GCI go here. In the 2014-2015 report, the 35th edition, innovation and skills are highlighted as being particularly important in influencing competitiveness, key attributes needed in the aftermath of global economic crisis. Alongside a recovering and unsettled economy, conflict and growing wealth inequality pose significant barriers to sustainable and inclusive growth, themes the report prioritizes. Political will and cooperation are of utmost importance in seeking a more resilient and fair global economy. Of these only the top three occur in the first half of the league table and African countries fill 15 of the lowest 20 spots. Areas in need of improvement include health, education and infrastructure. A significant threat highlighted is the growing youth population – “by 2035, more people will be reaching working age in sub-Saharan Africa than in the rest of the world put together”. The GCI has come under criticism for being opaque in its definition of competitiveness. On the one hand conflating it with productivity and prosperity while on the other having a high competitiveness score does not necessarily mean the country and its citizens are more prosperous than others. Instead the indicators are seen as being representative of WEF’s neoliberal politics. The WEF did, however, recently release The Inclusive Growth and Development Report, which engages with discussions to improve or develop new models of economic growth and development to expand social participation and benefit sharing. The report, which covers 112 economies, seeks to improve our understanding of how countries can use a diverse spectrum of policy incentives and institutional mechanisms to make economic growth more socially inclusive without dampening incentives to work, save and invest. There is no inherent trade-off in economic policy-making between the promotion of social inclusion and that of economic growth and competitiveness; it is possible to be pro-equity and pro-growth at the same time. Larger fiscal transfers are not necessarily incompatible with growth and competitiveness, but nor are they always the primary or most effective available option for broadening socioeconomic inclusion. Policies and institutions supporting social inclusion are not solely a luxury of high-income countries. There are, however, significant regional or cultural similarities. Seen from this practical, evidence-based perspective, the current debate on inequality and social inclusion is unduly narrow and unnecessarily polemicized. It is possible, indeed essential, to be pro-labour and pro-business, to advocate a strengthening of both social inclusion and the efficiency of markets. While the WEF’s new work stream on addressing inclusive growth and development may be welcome. There is a comprehensive and transparent index that was designed to overcome the problems of relying on GDP that is some 25 years old, the UN Human Development Index. The Index itself is formed of an equally weighted composite of three factors: life expectancy, education and GDP per capita, and although simple it receives global attention and says to policymakers that wealth is only one aspect in development. To be released in November this year the 2015 HDI will focus on work and human productivity, exhibiting some similarity between WEF’s productivity as economic competitiveness and the UN’s productivity as about unleashing human potential. One could get hung up on indices, many of which are based on imperfect data and reflect the philosophy of the organisations they are developed by. 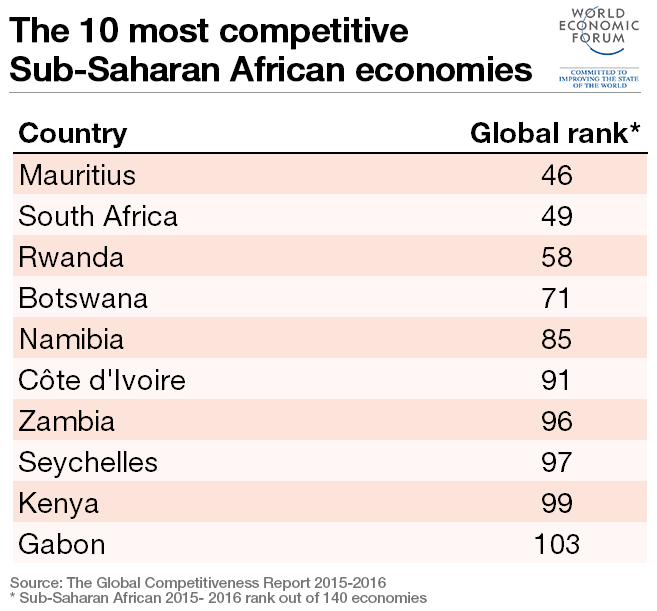 Whether it is important that WEF place Mauritius as the most competitive economy in Sub-Saharan Africa is unclear, although the fact that it is higher than countries like Turkey and Mexico makes for interesting reading. It is the detail that matters. What makes Mauritius more competitive than other economies in the region? Why do some countries lag behind in terms of their productivity, prosperity or their development? Learning from one another and advertising the importance of economic change and human development to politicians are where these indices succeed. All images are from the WEF Global Competitiveness Report 2014-2015, available at www.weforum.org/reports/global-competitiveness-report-2014-2015.